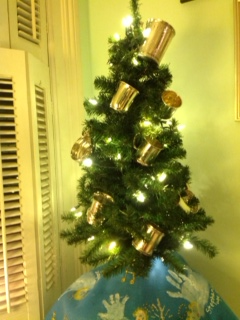 Christmas Tree, O Christmas Tree! 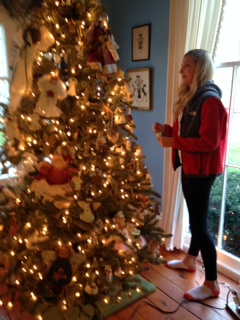 My niece, Gretchen, decorating Mom’s Angel Tree. A tradition for the Ohio cousins is to help my mom, “Grandma JoJo,” decorate one of the trees in her house: the Angel Tree. 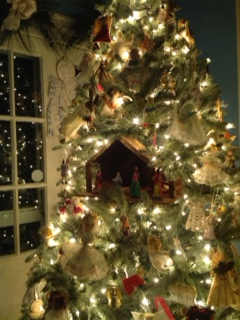 A heavenly host of angels has flown for many years around a nativity set that I made and painted in elementary school. The tree itself was started 52 years ago! Angels that don’t hang easily on the tree decorate the rest of the room, like a tall bamboo angel that sits on the piano, blowing a long trumpet. I found it on a dusty, high shelf in a Thailand shop about 23 years ago. 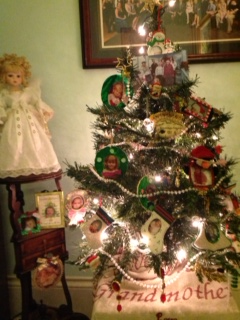 Many members of my family have contributed angels to the tree, so it is special to all of us. Someday, I’d like to have my old nativity set back, but I’m in no hurry–I love the fact that the angels on Mom’s tree have a special duty overseeing the manger scene, just like the angels who sang of Jesus’ birth to the shepherds near Bethlehem, over two thousand years ago. It gives me pause to think that I made that set not just when I was in the 5th grade, but literally, in my 5th grade public school class. I remember that amazing teacher helping us to fill the plaster of paris molds correctly so that there weren’t any air pockets; she taught us patience as we made piece after piece and waited for them to dry; she helped us treat each member of the cast with respect as we painted them in realistic colors. I don’t remember much about elementary school, but I do remember a lot about 5th grade. I get a little nostalgic when I think about this project, but maybe not for reasons you might expect. I understand how inappropriate it would be in a diverse school environment to spend all those hours on a Christian holiday project. But it does seem to me that maybe a public school could be the ideal environment for learning about, and enjoying, what is special about the many cultures represented by the students in our classrooms. Apart from an occasional library project where kids can research different holidays or cultures, this seems impossible for lots of reasons–perhaps a big one is a general lack of trust that teachers could be fair to other cultures. Perhaps an even bigger hurdle is simply that taking the kind of time that my 5th grade art project took would be seen as detrimental to kids, their test scores, and the reputation of the school. Yet, if I remember correctly, our test scores and school reputation were just fine–better than fine. Alas, society is complicated, and thus, so are schools. I don’t have any easy answers to the best use of time in a school day. I do know, though, that Christmas means many things to many different people, and tradition and memories seem to go hand in hand with the holiday. So, today I am feeling a little nostalgic. Perhaps remembering what was important to us as kids is a first step toward helping today’s kids focus on learning something important, too. What do YOU remember from elementary school? What impact did it make on your life? Share it in the comments! 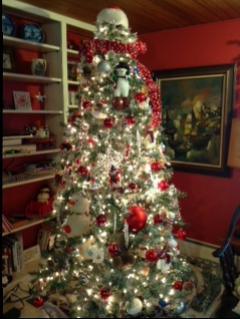 I can’t end this post in a blue mood at Christmastime, so please enjoy the pictures of my mom’s beautiful Christmas trees, posted by popular demand after this past week’s Wednesday’s Word! They are the “Snowman Tree,” the “Grandchildren Tree,” and the “Silver Baby Cup Tree,” complete with the hand painted angel tree skirt made with the grandchildren’s handprints. Enjoy! This entry was posted in Bible Stories, Christmas, Diversity, School and tagged angel tree, Being a Christian in a public school, Christmas. Bookmark the permalink. 2 Responses to Christmas Tree, O Christmas Tree! Loved this about your mom and her Christmas trees. Pictures are gorgeous. Thanks, Annita! How nice of you to read and comment. My mom will be glad to know you liked her trees! She usually has a Swedish tree in her kitchen, too. I’ll have to add a picture of that one if she did it this year!